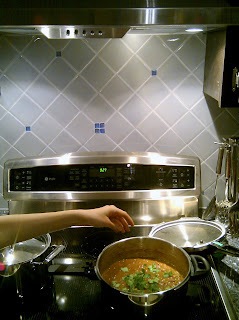 Today we made bhindi (okra) for dinner...it is one of our favorites. Okra is super-delicious and super-healthy , a combination that makes everyone happy. Washed and dried okra [important] and then cut them in small pieces. 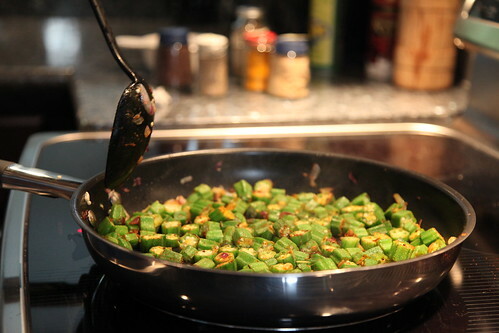 Roasted cumin and mustard seeds in oil, added onions and once onions were light brown, added garlic, ginger, green pepper and okra and heated for 5-7 minutes on medium heat. 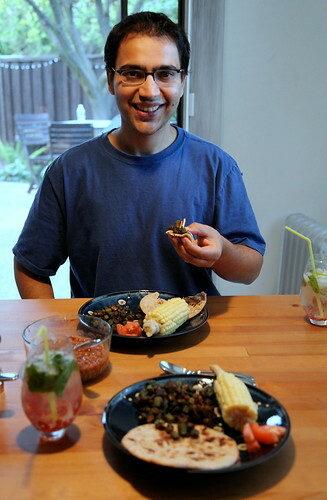 Afterwards, added a little bit of few spices (coriander powder, amchur, turmeric powder, cayenne pepper) and cooked for another 10-15 more minutes until bhindi looks close to done (it should not taste slimy and should have a dark-green color). Added a little butter and salt (salt should not be added earlier or okra will get soggier since salt will extract water out of it) and other spices to taste. 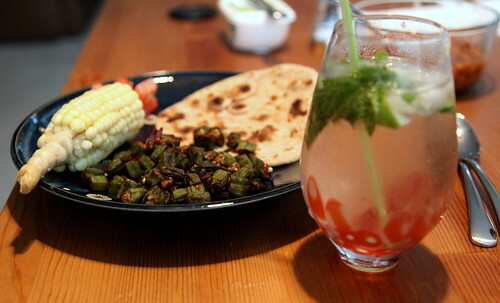 Served with corn and tandoori roti and mojito to compliment the spices. Being able to make your favorite food yourself is a satisfying feeling. 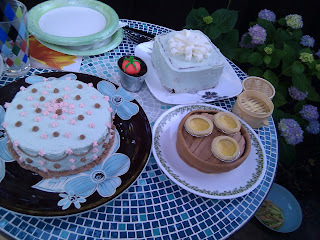 and yes, they do taste better when they are not round. 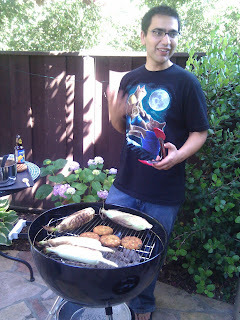 Here is Mohit grilling some burgers and corn. 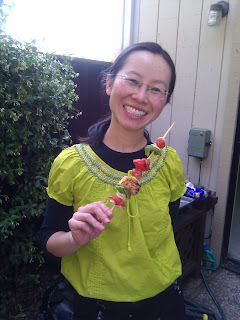 And Winnie holding a kabob with delicious paneer tika, plus onion, peppers, tomatoes, and mushrooms. Yay for long weekends! It's my favorite! 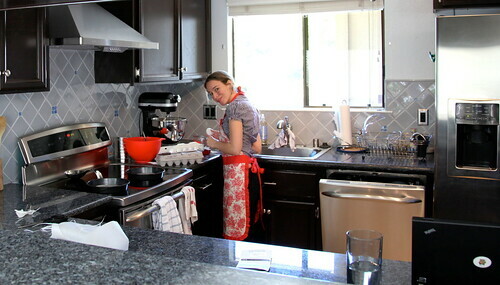 We don't follow the exact same recipe each time (sorry Kara). 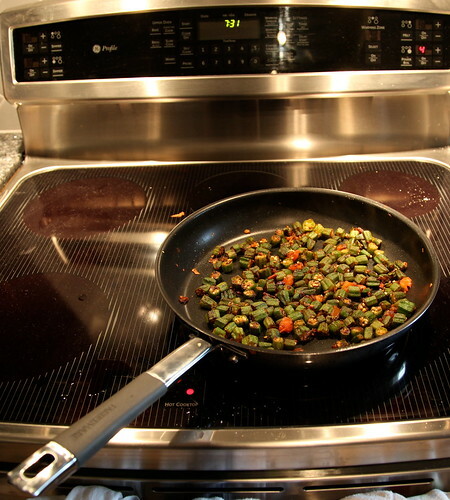 We start by sauteing onions in olive oil (and sometimes green pepper too). 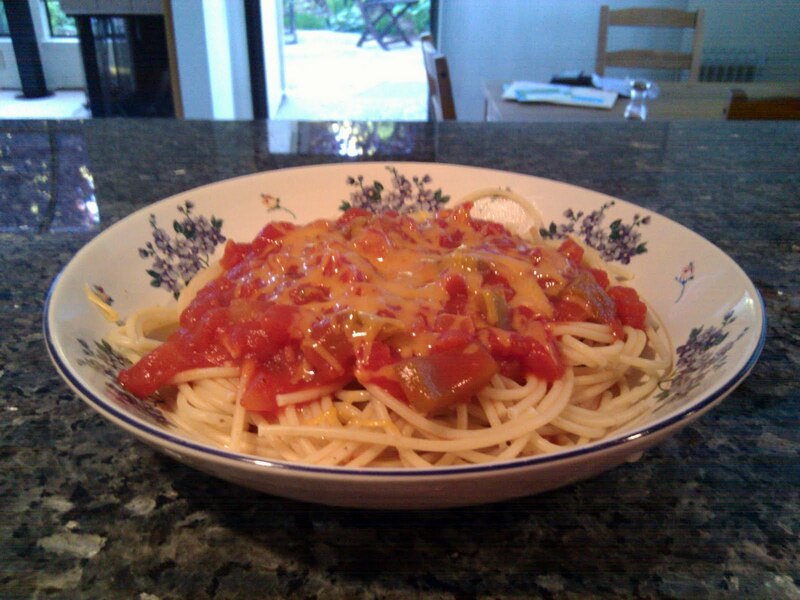 After that is ready, we add the tomatoes to it - this part varies depends on what is in the pantry - about 2 cans of diced tomatoes (Del Monte is our favorite!) and 1 can of tomato sauce. Then we add spices - salt, pepper, basil, a green serano chilli, maybe a bouillon cube... Bring to a boil and then cover and let simmer. 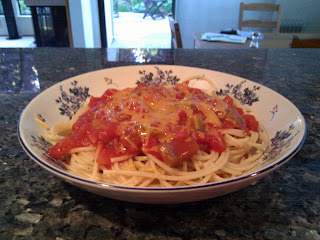 On this occasion we had some cheddar cheese to use up, so we grated it up on top in place of parmesan. Delicious fresh made tomato-basil soup! We started by sauteing onions, carrots and garlic, added diced tomatoes, chicken broth and basil, brought to boil and simmered for 20 minutes. The trick is after it was cooked we used an immersion blender to make it all smooth and creamy. 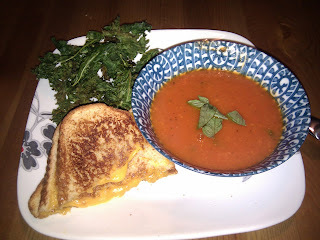 Of course when you have tomato soup you need to have grilled cheese! 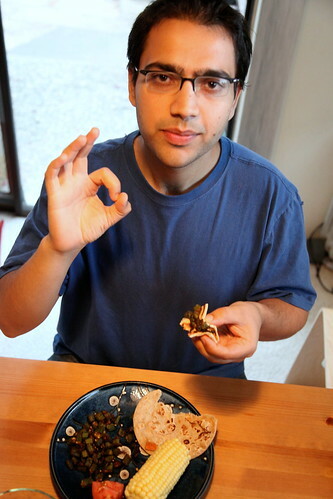 On the side we had some baked crispy kale chips - Mohit discoverd this recipe, just toss kale pieces in olive oil and salt, and bake on a cookie sheet - they taste amazing and totally un-kale like. 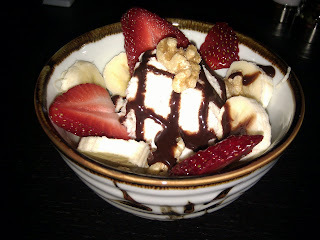 For desert: ice cream sundaes with walnuts, bananas, strawberries and chocolate sauce! Is the new ice cream maker a bad sign for our waistlines? Possibly. 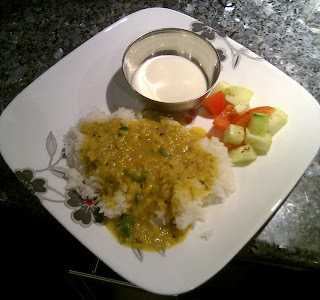 Toor daal is our favorite daal. 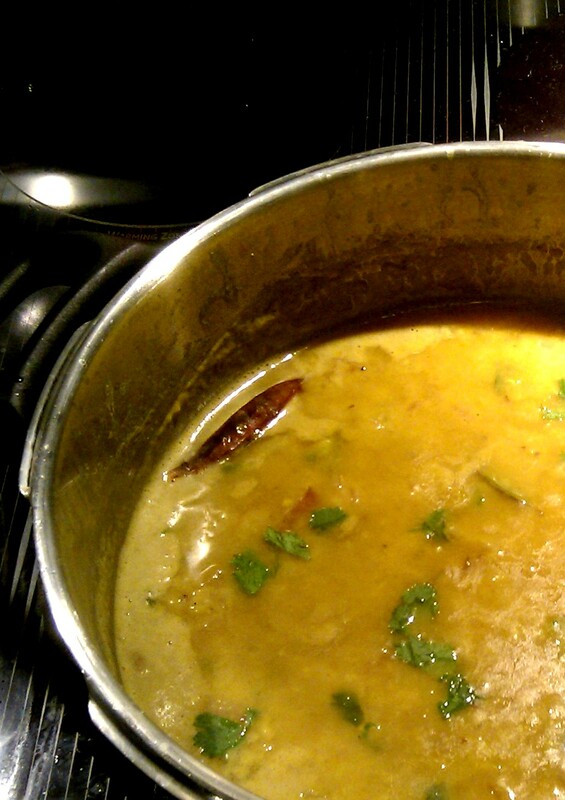 This daal [lentil] is used to make sambar as well, but it is very good on it's own too. Preparation was very similar to rajma... like most beans and lentils, soaked them for a few hours and then cooked them in pressure cooker for about 10 minutes with salt, turmeric and ginger. On the side, prepared 'tadka' aka 'chaunk' by sauteeing onions in oil with indian spices, green chilli, bay leaves and cloves. Then we added the tadka to the daal, threw in some garam masala, cilantro and let it boil for 10 mins or so until it gets thicker and spicier. It was very delicious and fresh tasting. Ate it with rice and yogurt on the side. 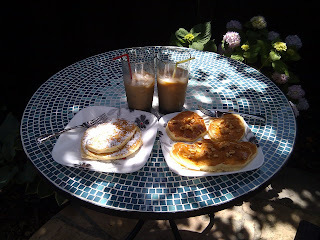 Afterwards, we also made home-made ice-cream! 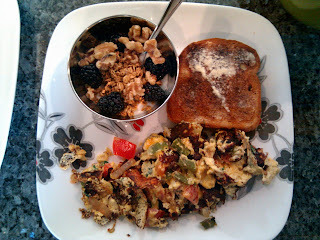 We made omelets (although they ended up kinda scrambled) with onion, tomato, green pepper, cilantro, and cheddar cheese! To accompany it we have a slice of toast, plus a yogurt parfait with granola, walnuts and fresh blackberries! 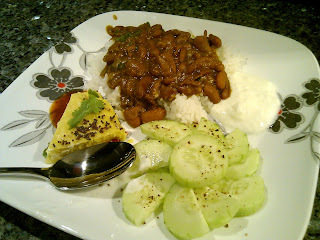 For our first dinner, we decided to make rajma (beans)..famous punjabi dish eaten with rice and yogurt. We soaked the beans for a few hours (canned ones aren't as good) and then we cooked them in pressure cooker for about 10-15 mins until they were soft. On the side, we sauteed onions with mustard seeds and cumin seeds and then added tomatoes, garlic, ginger and a few other spics (turmeric, salt, red pepper). Then we added the mix to rajma and cooked for another 15-20 minutes. Put in some garam masala, chilli peppers and cilantro towards the end. Yum! While our kitchen is being remodeled we are forced to cook on the floor of our living room. 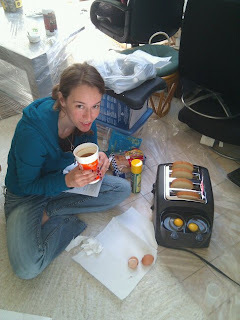 Luckily we recently received a toast and egg cooker as a wedding gift. With one device we can make 4 slices of toast and poach 2 eggs all at the same time! Other features would let us boil 8 eggs and heat up bacon/sausage patties. So far our toast and poached eggs have been perfectly cooked each time and we love it! Kinda ironically, the name of this amazing machine is Back to Basics - we highly recommend it.